The rest of the apartment of the first image is amazing see more of it here. 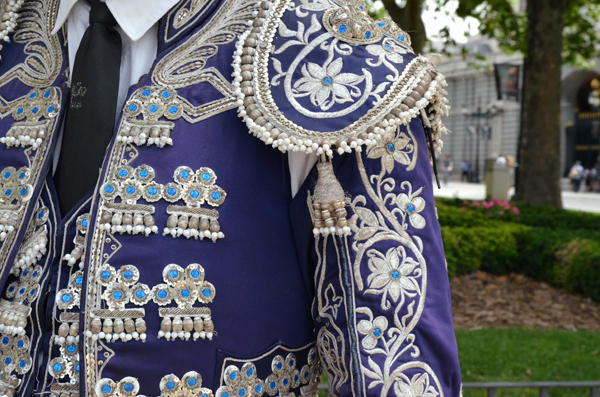 Last summer I caught this shot of a street performer dressed up as a torero in front of the Royal Palace in Madrid. Even though this suit is a "cheapie" you can still see all the handwork involved. Imagine what a real suit would look like. I bet you that the next big subject in photography after beaches seen from a bird's eye view or Marfa's Prada store (don't get me wrong I love these too) will be bullfighters! Ha! Not a bad a idea.....there is so much character there to be explored. On another note- If you are in the Dallas area this Friday and love skin care Tata Harper will be at Neiman Marcus (Northpark) giving a Master Class from 2:30 - 4. If you would like to come please email me and I will put you on the list. You can read more about her here. And don't forget to enter The Aestate's giveaway here. It ends on Dec. the 10th at midnight! You don't want to miss it. Que departamento más bello.. Adore esas zebras por todos lados!!! 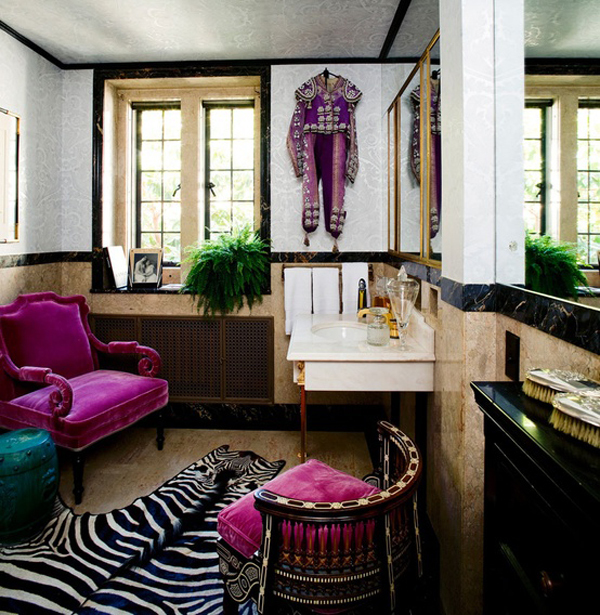 I need that hot pink chair in that powder room. What a colourful post! I love those rich purple chairs. 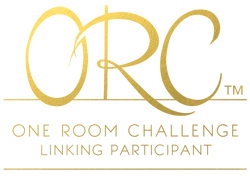 I have just nominated your lovely blog for an award! You’ll find the details on my blog at the end of today’s cupcakes post. Did you see last night's episode of Million Dollar Decorators? MLB just changed that 3rd room into a "neutral" room. He replaced the bullfighters on either side of the door with mirrors! BTW, did you ever consider this? That first room is one of my faves! Ah, my heart skips a beat. These rooms are high voltage for sure. 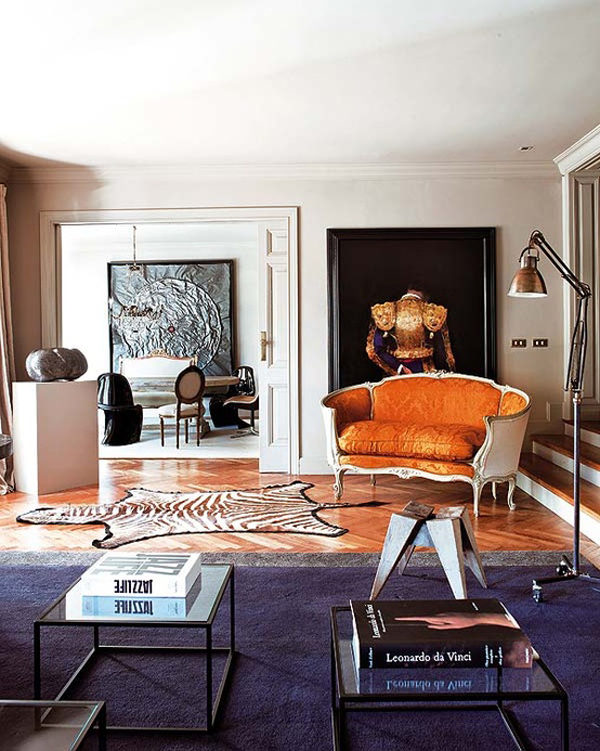 Love the way the fuchsia chairs and bullfighter suit work together in that second photo. These rooms are so powerful! The images are fabulous!!! Love the bull fighter art! I recently bough two large Spanish portraits at an antique store similar to the 4th picture. Can't wait to hang them up in my bedroom! So much fabulous eye candy going on here! Okay I am dying over that first image. Simply incredible. Stunning images and I love the flair! Una casa preciosa, llena de personalidad! !Me gusta lo que veo por tu blog!